Preface. I. Introduction (W.R. Crozier and A.J. Chapman). II. Symbols and Meanings in the Arts. Contributors: L. Hudson, V.J. Konecni, G. Kose and W.E. Smythe. III. The Arts and Development. Contributors: P. Blank, W.J. Dowling, H. Gardner, C. Massay, F. Pratt, J. Willats and E. Winner. IV. Perception of the Visual Arts. Contributors: H.S. Hock, A.T. Purcell and R.D. Walk. V. Perception of Music. Contributors: J.C. Bartlett, D. Deutsch, S. McAdams, J. Pressing and V. Vikis-Freibergs. VI. Issues in Experimental Aesthetics. Contributors: M.J. Apter, F. Boselie, E. Leeuwenberg, L.E. Marks and E. Temme. 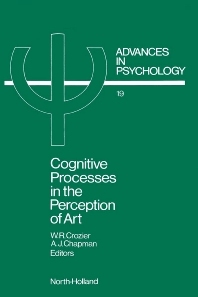 This book reviews progress and describes original research in the cognitive psychology of the arts. The invited contributors are leading authorities, and the topics which they cover include psychological approaches to symbols and meaning in art, issues in experimental aesthetics, the development in children of artistic production and appreciation, and the perception of musical and pictorial material.